Fair weather favoured the guests and volunteer crews for the Rotary Club of Newbury annual barge week which took place between the 8th & 14th September. Fairweather favoured the guests and volunteer crews for the Rotary Club of Newbury annual barge week which took place between the 8th & 14th September. The week gave the Newbury Rotary crews the opportunity of giving local community groups the pleasure of a day out on the beautiful Kennet & Avon canal on sections between Great Bedwyn and Woolhampton and back to Bedwyn again. This year they were delighted to entertain groups from Eight Bells Mental Health, Fairclose Day Centre, Kintbury Volunteers, The MS Society and The Polio Group.. 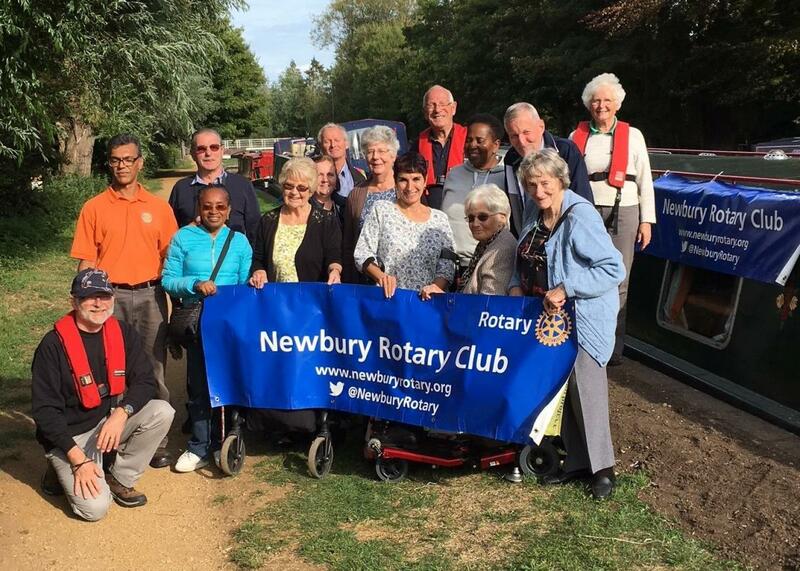 This is an annual event in Newbury Rotary’s Community calendar in which the club uses a specially adapted barge from the Kennet & Avon Canal Trust Bruce Branch fleet. Hannah is a specially-designed, purpose-built, wide-beam canal boat which can be used by disabled, disadvantaged or elderly people having wide-access ramps for boarding at the stern deck and a electro hydraulic lift down into the boat. The extra width of the boats provides excellent manoeuvrability for wheelchair users and they all have special built-in facilities. The final leg between Hungerford and Great Bedwyn proved to be hard graft with low water levels causing two other boats to be marooned. Not so with the Rotary team who managed to get the boat Hannah back to base.